A private tour to Panchgani and Mahabaleshwar, a popular getaway from the city and one of the few evergreen forests in the Sayadhri mountain range in India. 3-day tour of Mahabaleshwar from Mumbai in private cab. Take a tour of places like Mahabaleshwar Temple, Elphinstone Point, Arthur Seat Point, and many more during your two-day tour. Hassle-free touring at one of best hill stations from Mumbai. A little over 5 hours drive from Mumbai, Mahabaleshwar is a hill station in India's forested Western Ghats range. Mahabaleshwar is a must-see place. Mahabaleshwar offers pleasant weather all the year round and various attractions such as forts, great viewing points, and waterfalls. Due to high altitude, the town has cool weather. Mahabaleshwar is extremely famous for strawberries, accounting for 85% of the strawberry production in India. In this tour, visit the famous attractions around Mahabaleshwar and spend a leisurely time at the Western Ghats. Day 1: Start the journey from Mumbai. 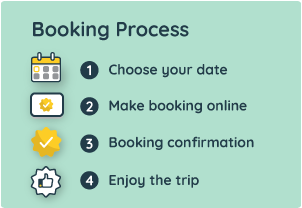 The tour begins with the pick-up from the airport OR the guest's hotel/residence in Mumbai city limits at the time selected during the booking. The drive to Mahabaleshwar is around 265 km from Mumbai and may take up to hours to reach. Panchgani is at the foothills of Mahabaleshwar, we recommend stopping by the famous Mapro Gardens for refreshments or meal. Elephant's Head Point and Kate's Point - The specialty of this point is that this point has a structure which looks like a head and trunk of an elephant formed from rock. Mahabaleshwar Temple - an ideal example of Maratha heritage and dedicated to lord Shiva. Elphinstone Point- this gives a panoramic view of the valleys and is a must-visit attraction. Arthur Seat Point- This is called the queen of all the viewpoints which has 6 viewpoints like echo point, hunter point, tiger spring point, window point and malcom point. Venna Lake - This lake is surrounded by trees and tourist can enjoy boating over there. Bombay / Sunset Point - People can witness amazing sunset from this point. At the completion of the tour, the guests will be dropped back to the hotel/residence in Mahabaleshwar OR Panchgani, as per the guest's convenience. The local sightseeing tour starts with the pick-up from the hotel/residence in Mahabaleshwar OR Panchgani at the time communicated to the driver by the guests. Wilson Point / Sunrise Point - Also called as Sindola hill, which provide a mesmerizing vista of Mahabaleshwar and the surrounding area. Parsi Point- Popular attraction with the views of Krishna valley. Table Land- is the highest point in Panchgani. The guests may break for lunch during the tour at their convenience. At the completion of the tour, the guests will be dropped back to the hotel/residence. Panch Ganga Mandir- Temple is constructed at the confluence of five rivers, Krishna, Veena, Savitri, Koyna and Gayatri. Krishnabai Temple- This temple was supposed to be the source of the Krishna river. The journey to Mumbai may take up to 6 hours, so the guests are requested to start their return journey in time if they are required to reach Mumbai at a specific time. The tour ends on dropping the guests at the airport OR hotel/residence in Mumbai city limits. Any accommodation and meals for the guests. Pick-up and drop off should be the same location. The pick-up & drop off location can be different but extra charges will apply as per distance from pick-up location and can be paid to the driver directly. The tour has a kilometer limit of 850 kilometers. Distance is calculated from the pick-up point till the drop point. After 850 kilometers, additional per kilometer charge will be applicable (to be paid directly to the driver).